Selecting a treasury workstation (also known as a treasury management system) can be challenging. Each treasury workstation has different operational strengths, platform technologies, internal control functionality, pricing structures, etc. Avoid the common pitfalls related to treasury workstation projects by retaining TreaSolution to assist your treasury department. Our treasury workstation experts will assist your organization in selecting and implementing a treasury workstation that meets or exceeds your treasury management requirements. TreaSolution will assist your treasury department in procuring the optimal treasury workstation due to our tremendous amount of experience creating, distributing, evaluating and scoring treasury technology RFPs. Our treasury consultants will help create a customized treasury workstation RFP which addresses your organizational requirements. When creating your treasury workstation RFP, TreaSolution will leverage our Treasury Workstation RFP Database. This database of treasury workstation questions will not only help ensure you organization issues a comprehensive RFP, but it will also help make the entire RFP process more efficient! 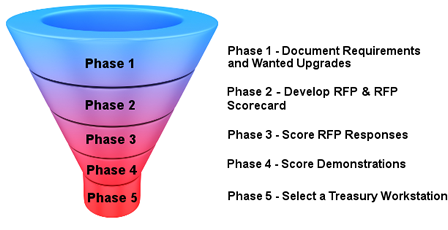 When the RFP responses are returned, your organization will have the option of using TreaSolution's proprietary treasury workstation RFP scorecard methodology. Our RFP scorecard calculates several key evaluation metrics pertaining to operational, technical, security and budget requirements. Ultimately, TreaSolution's treasury workstation consulting services will help ensure an apples-to-apples comparison of all technology vendors. TreaSolution utilizes a five-phased approach with our Treasury Workstation (or Treasury Technology) selection projects. TreaSolution is an industry leader in treasury workstation consulting. For each treasury workstation project, TreaSolution treasury consultants will customize a treasury workstation project plan to help ensure your project's success. Our consultants have the experience and intellectual capital to assist your organization with every aspect of a treasury workstation project. By retaining TreaSolution your treasury department will leverage our extensive experience with the creation, evaluation and scoring of treasury workstations. Please feel free to Contact Us for a customized, no-obligation treasury workstation consulting estimate which will include a detailed project description, our qualifications and references. Business Justification: Determination if there is a business case for implementing a treasury workstation. Budget Range: Determination of an appropriate budget range (which will considers all major variables of a treasury workstation project). Project Scope: Determination of which treasury workstation modules would provide the most meaningful improvements for treasury and cash operations. Ensure that your upcoming treasury workstation journey starts off on the right foot! Contact TreaSolution today to learn more about how our treasury workstation consultants can create a comprehensive cost benefit analysis report for your organization. TreaSolution performed a treasury review and treasury workstation RFP creation project for a $2.15 billion multilateral development bank. The treasury review consisted of reviewing and documenting all cash operations which were decentralized within the organization. After reviewing all applicable processes, TreaSolution benchmarked them against our proprietary database of treasury management best practices. The treasury review report consisted of best practice recommendations pertaining to process and technology utilization. The second phase of this project was to develop a treasury workstation scope and develop a comprehensive RFP. TreaSolution utilized our experience and knowledge of this organization's cash management processes to document all current and future requirements. Additionally, TreaSolution conducted meetings with management to develop a treasury workstation selection and implementation budget. The deliverable of this project was a thorough treasury workstation RFP which led to the selection of a treasury workstation which was ultimately utilized to centralize the majority of cash operations. TreaSolution was retained by an international real estate investment management company to conduct a comprehensive treasury review coupled with a treasury workstation cost benefit analysis. Over a four week period, TreaSolution reviewed, documented and benchmarked our client's critical treasury operations, treasury technology and internal controls in order to create a comprehensive treasury review report. Additionally, TreaSolution's client requested that we leverage our treasury review data in order to create a treasury workstation cost benefit analysis report. TreaSolution's treasury consultants estimated the annual cost savings and profit enhancements that could potentially be gained by implementing a treasury workstation. Furthermore, the treasury workstation cost benefit analysis provided general budget guidance pertaining to a potential treasury workstation project. #1 - We have over 15 years experience selecting, researching and implementing treasury workstations. #2 - We assist our clients in efficiently creating comprehensive RFPs by leveraging our treasury workstation RFP question database. #3 - We facilitate an apples-to-apples comparison of treasury workstation vendors via our proprietary RFP scorecard. #4 -We incorporate industry-specific treasury best practices into every treasury technology project. #5 - Our proven RFP process will help your organization save time and select the optimal treasury workstation provider. #6 - Our past clients think we do excellent work... View our Client Testimonials to learn more! 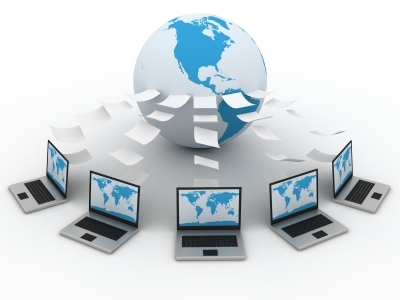 Would you like to learn more about selecting a treasury workstation? We'd be happy to schedule a phone call to discuss this topic in more detail.